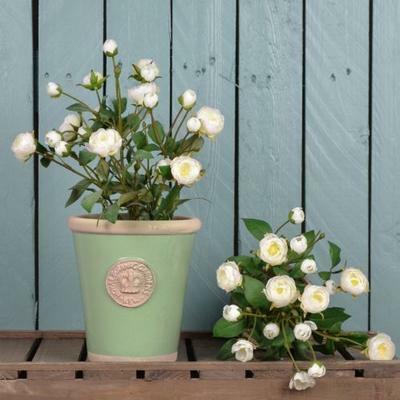 The Kew Royal Botanic Gardens Long Tom Pot Faux Baby Rose Shrub in Chartwell Green makes for a charming addition to your indoor or outdoor space. Made from lovely faux shrub, you won't have to worry about watering the plants year round! Each shrub is placed in a lovely cement pot that accentuates its beauty. The pot itself is also quite charming. For this one you get the lovely Chartwell green shade but you can choose from other colors. You can give this away as a present to friends or family. It's best displayed in the kitchen, living space or even a covered patio.